Kellogg Community College will remember the men and women who died while serving in the United States armed forces with a Memorial Day Ceremony Wednesday, May 25. The event, which is free and open to the public, will begin at noon in the Binda Performing Arts Center on campus at 450 North Ave., Battle Creek. 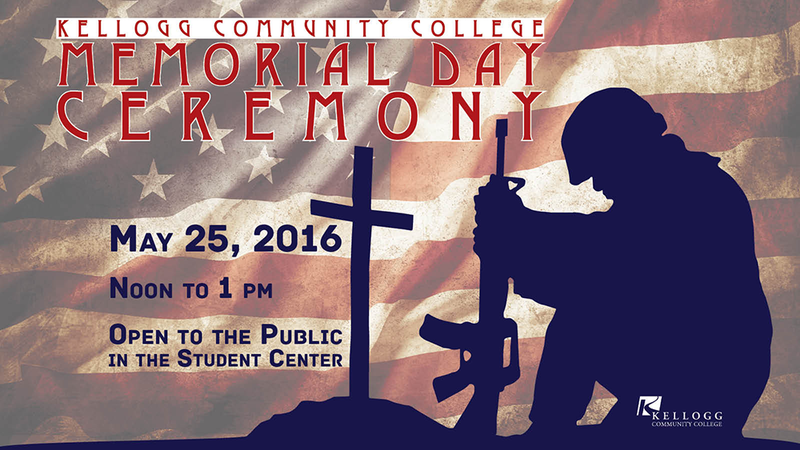 The ceremony will include patriotic music and presentations by KCC students and staff. Steve Claywell, chairman of the KCC Board of Trustees, will lead the Pledge of Allegiance, while KCC President Mark O’Connell will recite the poem “In Flanders Field.” KCC’s Director of Institutional Facilities and Public Safety John Di Pierro, a retired Air Force colonel, will serve as master of ceremonies. Retired Lt. Col. John W. Anderson, secretary and treasurer of the Fort Custer Historical Society, will be the keynote speaker. A color guard presentation will be provided by the Michigan Air National Guard 110th Attack Wing Division. The event will conclude at approximately 1 p.m. with a gun salute and the laying of a commemorative wreath at the base of the flag pole at the entrance to campus. All KCC campuses will be closed on Monday, May 30, which is Memorial Day.